"Chevy" redirects here. For the American comedian, see Chevy Chase. For other uses, see Chevrolet (disambiguation). Chevrolet-branded vehicles are sold in most automotive markets worldwide. In Oceania, Chevrolet is represented by GM subsidiary, Holden, having returned to the region in 2018 after a 50-year absence with the launching of the Camaro and Silverado pickup truck. In 2005, Chevrolet was relaunched in Europe, primarily selling vehicles built by GM Daewoo of South Korea with the tagline "Daewoo has grown up enough to become Chevrolet", a move rooted in General Motors' attempt to build a global brand around Chevrolet. With the reintroduction of Chevrolet to Europe, GM intended Chevrolet to be a mainstream value brand, while GM's traditional European standard-bearers, Opel of Germany, and Vauxhall of United Kingdom would be moved upmarket. However, GM reversed this move in late 2013, announcing that the brand would be withdrawn from Europe, with the exception of the Camaro and Corvette in 2016. Chevrolet vehicles will continue to be marketed in the CIS states, including Russia. After General Motors fully acquired GM Daewoo in 2011 to create GM Korea, the last usage of the Daewoo automotive brand was discontinued in its native South Korea and succeeded by Chevrolet. On November 3, 1911, Swiss race car driver and automotive engineer Louis Chevrolet co-founded the Chevrolet Motor Company in Detroit with William C. Durant and investment partners William Little (maker of the Little automobile), former Buick owner James H. Whiting, Dr. Edwin R. Campbell (son-in-law of Durant) and in 1912 R. S. McLaughlin CEO of General Motors in Canada. Durant was cast out from the management of General Motors in 1910, a company which he had founded in 1908. In 1904 he had taken over the Flint Wagon Works and Buick Motor Company of Flint, Michigan. He also incorporated the Mason and Little companies. As head of Buick, Durant had hired Louis Chevrolet to drive Buicks in promotional races. Durant planned to use Chevrolet's reputation as a racer as the foundation for his new automobile company. The first factory location was in Flint, Michigan at the corner of Wilcox and Kearsley Street, now known as "Chevy Commons" at coordinates 43°00′31″N 83°42′36″W﻿ / ﻿43.00863°N 83.70991°W﻿ / 43.00863; -83.70991﻿ (Chevy Commons), along the Flint River, across the street from Kettering University. Actual design work for the first Chevy, the costly Series C Classic Six, was drawn up by Etienne Planche, following instructions from Louis. The first C prototype was ready months before Chevrolet was actually incorporated. However the first actual production wasn't until the 1913 model. So in essence there were no 1911 or 1912 production models, only the 1 pre-production model was made and fine tuned throughout the early part of 1912. Then in the fall of that year the new 1913 model was introduced at the New York auto show. Chevrolet first used the "bowtie emblem" logo in 1914 on the H series models (Royal Mail and Baby Grand) and The L Series Model (Light Six). It may have been designed from wallpaper Durant once saw in a French hotel room. More recent research by historian Ken Kaufmann presents a case that the logo is based on a logo of the "Coalettes" coal company. An example of this logo as it appeared in an advertisement for Coalettes appeared in the Atlanta Constitution on November 12, 1911. Others claim that the design was a stylized Swiss cross, in tribute to the homeland of Chevrolet's parents. Over time, Chevrolet would use several different iterations of the bowtie logo at the same time, often using blue for passenger cars, gold for trucks, and an outline (often in red) for cars that had performance packages. Chevrolet eventually unified all vehicle models with the gold bowtie in 2004, for both brand cohesion as well as to differentiate itself from Ford (with its blue oval logo) and Dodge (who has often used red for its imaging), its two primary domestic rivals. Louis Chevrolet had differences with Durant over design and in 1914 sold Durant his share in the company. By 1916, Chevrolet was profitable enough with successful sales of the cheaper Series 490 to allow Durant to repurchase a controlling interest in General Motors. After the deal was completed in 1917, Durant became president of General Motors, and Chevrolet was merged into GM as a separate division. In 1919, Chevrolet's factories were located at Flint, Michigan; branch assembly locations were located in Tarrytown, N.Y., Norwood, Ohio, St. Louis, Missouri, Oakland, California, Ft. Worth, Texas, and Oshawa, Ontario General Motors of Canada Limited. McLaughlin's were given GM Corporation stock for the proprietorship of their Company article September 23, 1933 Financial Post page 9. In the 1918 model year, Chevrolet introduced the Series D, a V8-powered model in four-passenger roadster and five-passenger tourer models. Sales were poor and it was dropped in 1919. Beginning also in 1919, GMC commercial grade trucks were rebranded as Chevrolet, and using the same chassis of Chevrolet passenger cars and building light-duty trucks. GMC commercial grade trucks were also rebranded as Chevrolet commercial grade trucks, sharing an almost identical appearance with GMC products. Chevrolet continued into the 1920s, 1930s, and 1940s competing with Ford, and after the Chrysler Corporation formed Plymouth in 1928, Plymouth, Ford, and Chevrolet were known as the "Low-priced three". In 1929 they introduced the famous "Stovebolt" overhead-valve inline six-cylinder engine, giving Chevrolet a marketing edge over Ford, which was still offering a lone flathead four ("A Six at the price of a Four"). In 1933 Chevrolet launched the Standard Six, which was advertised in the United States as the cheapest six-cylinder car on sale. Chevrolet had a great influence on the American automobile market during the 1950s and 1960s. In 1953 it produced the Corvette, a two-seater sports car with a fiberglass body. In 1957 Chevy introduced its first fuel injected engine, the Rochester Ramjet option on Corvette and passenger cars, priced at $484. In 1960 it introduced the Corvair, with a rear-mounted air-cooled engine. In 1963 one out of every ten cars sold in the United States was a Chevrolet. During the 1960s and early 1970s, the standard Chevrolet, particularly the deluxe Impala series, became one of America's best selling lines of automobiles in history. The basic Chevrolet small-block V8 design has remained in continuous production since its debut in 1955, longer than any other mass-produced engine in the world, although current versions share few if any parts interchangeable with the original. Descendants of the basic small-block OHV V8 design platform in production today have been much modified with advances such as aluminium block and heads, electronic engine management, and sequential port fuel injection. Depending on the vehicle type, Chevrolet V8s are built in displacements from 4.3 to 9.4 litres with outputs ranging from 111 horsepower (83 kW) to 994 horsepower (741 kW) as installed at the factory. The engine design has also been used over the years in GM products built and sold under the Pontiac, Oldsmobile, Buick, Hummer, Opel (Germany), and Holden (Australia) nameplates. In 2005, General Motors re-launched the Chevrolet marque in Europe, using rebadged versions of the Daewoo cars produced by GM Korea. The Chevrolet division has largely recovered from the economic downturn of 2007–2010 through launching new vehicles and improving existing lines. GM began developing more fuel efficient cars and trucks to compete with foreign automakers. In late 2010 General Motors began production of the plug-in hybrid Chevrolet Volt, sold as the Opel/Vauxhall Ampera in Europe, which received multiple awards including the 2012 North American Car of the Year, European Car of the Year, and World Green Car of the Year. The Volt/Ampera family was the world's best selling plug-in electric car in 2012 with 31,400 units sold. The Opel/Vauxhall Ampera was Europe's top selling plug-in electric car in 2012 with 5,268 units, representing a market share of 21.5% of the region's plug-in electric passenger car segment. Combined global Volt/Ampera sales passed the 100,000 unit milestone in October 2015. As of June 2016[update], the Volt family of vehicles ranks as the world's all-time top selling plug-in hybrid, and it is also the third-best-selling plug-in electric car ever, after the Nissan Leaf and the Tesla Model S. Volt sales in the American market passed the 100,000 milestone in July 2016. In October 2016, GM began production of the Chevrolet Bolt EV, the first ever affordable mass market all-electric car with a range over 200 mi (320 km). The Chevrolet Bolt won several awards including the 2017 Motor Trend Car of the Year award, the 2017 AutoGuide.com Reader’s Choice Green Car of the Year, Green Car Reports Best Car To Buy 2017, Green Car Journal's 2017 Green Car of the Year, and was listed in Time Magazine Best 25 Inventions of the Year of 2016. As of 2010[update] Chevrolet had operations in over 140 countries, and global sales in 2011 set a record with 4.76 million vehicles sold worldwide. Mexico has a mix of Chevrolet models from different GM brands and platforms branded as Chevrolet. The models come from Chevrolet USA, GM Korea, Mexico and other origins. Examples of Opel-sourced vehicles are Vectra, Astra, Corsa, Meriva, Zafira and Captiva (Opel Antara). Mexico also has some cars of its own, such as the Chevy C2, which is a reworked older-generation Corsa B. Vehicles based on US platforms are the Avalanche, the Suburban, the Equinox, the Tahoe, the Cheyenne (which is similar to the Silverado), the Aveo, the HHR, the Traverse, the Malibu, the Camaro and the Corvette. The Chevrolet Optra, assembled in South Korea by GM Korea, was also sold in Mexico. The European Epica was sold as a business-only vehicle. GM also manufactures Chevrolet vehicles such as the Suburban and Avalanche in Mexico for export to other markets, chiefly the US and Canada; those vehicles are no longer assembled in Mexico. In 2009 China became Chevrolet's third-largest market, with sales of 332,774 vehicles, behind only the United States and Brazil (1,344,629 and 595,500 vehicles respectively). By 2010, Chevy sold just over half a million, with the Cruze being its best seller there. Launched by GM's India operations, Chevrolet is among the more recent auto brands. Until 2003, GM India—originally a joint venture with Hindustan Motors, sold the Opel Corsa, Opel Astra and the Opel Vectra. Chevrolet officially began business in India on June 6, 2003. The Corsa and Astra were built at a plant in Halol, Gujarat. Chevrolet sold the Chevrolet Cruze, Chevrolet Spark, Chevrolet Optra, Chevrolet Aveo, Chevrolet Tavera, Chevrolet Captiva, Chevrolet SRV, Chevrolet Beat, Chevrolet Sail and Chevrolet Aveo U-VA. The Chevrolet Forester, a rebadged Subaru, was imported directly from Fuji Heavy Industries in Japan until 2005. The Cruze and Tavera were built at the Halol plant. Chevrolet also was the sole Engine supplier for the Formula Rolon single seater series in India. In May 2017, GM announced that it would cease the production and sale of Chevrolet cars in India, but will continue to run service centers. From 1995 to 2000 Toyota in an agreement with GM sold the third generation model Chevrolet Cavalier as the Toyota Cavalier in Japan in exchange for the Geo/Chevrolet Prism in an effort to avoid additional restrictions on their exports to the US. In the mid-2000s, Suzuki imported and marketed the Chevrolet TrailBlazer and the Chevrolet Optra wagon in Japan. Suzuki, a GM partner, also assembled and marketed the Chevrolet MW microvan. The MW was originally a rebadged Suzuki Wagon R+ and later a rebadged Suzuki Solio. Suzuki had also marketed the Chevrolet Cruze subcompact in the past. Earlier efforts during the 1970s and 1980s saw a partnership with Isuzu and Suzuki, with the Chevrolet Chevette in the 1970s from Isuzu, and the Suzuki Cultus from Suzuki during the 1980s, which was rebadged as the Geo Metro. General Motors Japan Limited currently distributes and markets the Sonic, Captiva, Camaro, and Corvette in limited numbers through an agreement with Yanase Co., Ltd. dealerships. In the 2000s, General Motors Asia Pacific (Japan) had distributed and marketed the TrailBlazer also. As of 2010[update], Mitsui Bussan Automotive distributes and markets the Chevrolet Tahoe, Chevrolet Express, Chevrolet HHR, Silverado, and Traverse. Previously, it had also marketed the Starcraft versions of the G-Van and Chevrolet TrailBlazer. Mitsui Bussan Automotive had been importing and distributing certain GM models since 1992, but will cease their GM import business in November 2011, as GM Japan wants to consolidate the distribution channels. The Chevrolet models that have been imported by Mitsui will no longer be sold once existing inventories are depleted. Thus there were three distinct distribution channels for Chevrolet-branded vehicles at one time in Japan. Chevrolet entered Malaysian market in 2003, replacing Opel. Between 2003 and 2009, a joint-venture between GM and DRB-HICOM called Hicomobil, marketed the Chevrolet Aveo, Chevrolet Optra, Chevrolet Nabira and Chevrolet Lumina. The joint venture was ended and Naza was taking over Chevrolet's dealership as Naza Quest Auto Sdn.Bhd in 2010. The lineup of Chevrolet cars available were Chevrolet Sonic, Chevrolet Cruze, Chevrolet Malibu, Chevrolet Captiva, Chevrolet Orlando and Chevrolet Colorado. In the Middle East, Chevrolet-badged cars, trucks, SUV's, and crossovers are sourced from GM Korea (in South Korea), GM in North America, and GM Holden (in Australia). The Middle East market has a separate division called Chevrolet Special Vehicles, which (as of December 2007) sources the high-performance 400 bhp (300 kW) CR8 sedan from Holden Special Vehicles. The Holden Commodore is badged as the Chevrolet Lumina in the Middle East, as well as South Africa. The longer wheelbase Holden Caprice was sold as the Chevrolet Caprice in the Middle East. The Middle East fleet (particularly Saudi Arabia) also includes the likes of Cruze, Malibu and Sonic in the Sedan category, Captiva in the SUV category, Tahoe and Traverse in the Wagon category and Avalanche and Silverado in the Truck category. In Pakistan, Chevrolet introduced its cars in collaboration with a local automobile manufacturer called Nexus Automotive. The lineup from Chevrolet Pakistan included the Chevrolet Optra, Chevrolet Spark, Chevrolet Joy, Chevrolet Aveo, Chevrolet Cruze, and Chevrolet Colorado. Chevrolet's Philippine operations are under the control of The Covenant Car Company Inc. The company was officially incorporated on July 1, 2009 and assumed business operations on October 1, 2009. 19 dealerships have been established around the country as of 2012. Its current lineup include the Chevrolet Aveo, Chevrolet Camaro, Chevrolet Captiva, Chevrolet Colorado, Chevrolet Cruze, Chevrolet Orlando, Chevrolet Spark, Chevrolet Sonic, Chevrolet Suburban, Chevrolet Tahoe, Chevrolet TrailBlazer, Chevrolet Malibu, Chevrolet Traverse, and after its 2014 introductions, Chevrolet Silverado, Chevrolet Impala, Chevrolet Trax and Chevrolet Express Van. In November 2018, Chevrolet announced that the Corvette will be added to the roster, making it the most expensive vehicle in the lineup; this will be legally imported, as the government has seized and destroyed expensive vehicles that were bought into the country illegally. In April 4, 2019, Chevrolet announced that the Camaro will return to the Philippines with a 2.0-liter turbo engine at 275hp and 398Nm to compete with the Ford Mustang ever since it was introduced in 2010. Many global-market Chevrolet vehicles are designed and manufactured by GM Korea of South Korea, but they had been sold under the Daewoo Motors brand in South Korea until February 2011. The Daewoo brand was fully replaced by Chevrolet in March 2011. All Daewoo products relaunched under the Chevrolet brand, with the release of the Chevrolet Camaro, Chevrolet Orlando and Chevrolet Aveo. In 2015, the Impala was added to the lineup as Chevrolet began importing the American-built sedan to South Korea for the first time.In 2018,Gunsan plant was shut down in May 31 and VIDAMCO plant in Hanoi, Vietnam was sold by Vinfast in June.Chevrolet Cruze and Chevrolet Orlando was discontinued in May 31. Also Chevrolet Captiva discontinued in July 2018.Their Best-Selling vehicle is Chevrolet Spark and Chevrolet Malibu. The American-built Chevrolet Colorado pickup is also manufactured in Rayong, Thailand. Starting in 2003, the Holden Commodore was badged as the Chevrolet Lumina in Thailand for the VY and VZ model series. Exports lasted until 2005. In addition to the Colorado pickup trucks, General Motors began assembling Chevrolet Captiva sport utility vehicle in its Rayong plant during June 2007. The Thai-assembled Captiva is based on THETA platform under the program code C100. Also produced at the General Motors' Rayong plant are the Chevrolet Aveo (launched in September 2009 under the platform T100) and Chevrolet Cruze (launched in November 2010 under the platform GLOBAL DELTA). General Motors Uzbekistan, or GM Uzbekistan, became the new name of Uz-Daewoo Auto in March 2008 as part of a new joint venture owned by Uzavtosanoat JSC (75%) and General Motors Corporation (25%) with a factory in Asaka producing a variety of Chevrolet models. Currently, in Uzbekistan producing models, such as, Damas (N150), Matiz (M150), Nexia (N150), Spark (M300), Epica, Malibu and Captiva (SUV). Even though the Australian market of today mainly consists of Australia's own automotive companies alongside Asian automobile brands, Australia once had its fair share of American cars as well. Bodies for the local assembly of Chevrolets were built in Australia as early as 1918:11 and by 1926 the newly created General Motors (Australia) Pty Ltd had established assembly plants in five Australian states to produce Chevrolet and other GM vehicles using bodies supplied by Holden Motor Body Builders. The merger of General Motors (Australia) Pty Ltd with the troubled Holden Motor Body Builders in 1931 saw the creation of General Motors-Holden and the ongoing production of various GM products including Chevrolet. GMH departed from traditional US body styles with the release of the Chevrolet Coupe Utility in 1934:4 and the Chevrolet "Sloper" Coupe in 1935.:5 Post-war production recommenced in 1946. From 1949 Australian Chevrolets were to be locally assembled from components imported from Chevrolet in Canada although local production of the Coupe Utility body continued until 1952. 1968 was the last full year of Chevrolet assembly in Australia. Classic Chevrolet models such as Bel Air, Biscayne, Impala etc., are still found in many states around Australia. From the early 1970s to the early 1980s the Chevrolet name was also used on various light commercials in Australia. These ranged from the LUV (a rebadged Isuzu KB) to the third generation C-series trucks. From 1998 to 2001 the Chevrolet Suburban was sold in Australia as the Holden Suburban. Chevrolet and Holden share a number of models and model names including Malibu, Caprice, Colorado, Volt, Spark/Barina Spark, Sonic/Barina, Cruze, Equinox, and VF Commodore/Chevrolet SS. The Holden VF Commodore was exported from Australia to the United States as the Chevrolet SS until Holden ended production in May 2017 during its transition to a distribution platform of vehicles that are sourced from GM's American and international plants that is expected to badge as Holden vehicles. In December 2017, GM announced the return of the Chevrolet brand to Australia and New Zealand with the launch of the Camaro 2SS Coupe and the Silverado 2500HD/3500HD; the vehicles went on sale in the region in 2018. These vehicles retained the Chevrolet badge and nameplate, and converted to RHD in Australia. In addition to the relaunch, Holden Special Vehicles added the Camaro and Silverado to their performance lineup. 1974 Braaivleis, rugby, sunny skies and Chevrolet advert at the Springbok Radio preservation society. In South Africa, Chevrolet was GM's main brand name until 1982, with a number of Vauxhall Motors and Holden derivatives being built under the Chevy name from 1965. In the 1970s, the advertising jingle "braaivleis, rugby, sunny skies and Chevrolet" (adapted from the US "Baseball, Hot Dogs, Apple Pies and Chevrolet") came to epitomise the ideal lifestyle of white male South Africans. Holden in Australia used the jingle "Football, Meat Pies, Kangaroos and Holden cars". Originally, Chevrolets were CKD kits of US models assembled in their plant in Port Elizabeth. However, since South Africa was right-hand drive and the US was left-hand drive, along with encouragement by the South African government to use local content, Chevrolets such as the Biscayne were eventually made entirely in South Africa, along with GM's "own car for South Africa": the Ranger. By the 1970s, larger South African Chevrolets were based on Australian General Motors-Holden's models, the Kommando being based on the Holden Kingswood and the Constantia on the Statesman, while the smaller Firenza was based on the Vauxhall Viva. The Chevrolet Nomad sold in South Africa was entirely different from the Nomad sold in America; whereas the American Nomad was originally conceived as a station wagon version of the Corvette and eventually became the station wagon version of the Bel Air, the South African Nomad was an SUV of truck proportions before SUVs were popular. Due to local content laws the cars usually received different engines than in their home markets. However, these were replaced by Opel models like the Rekord, Commodore, and Senator, and in 1982 the Chevrolet brand name was dropped in favour of Opel. Because of the political climate at the time, GM decided to divest from South Africa in 1986, and a local group eventually bought out GM's South African operations (including the Port Elizabeth plant) and renamed the company Delta Motor Corporation, which concentrated on Opels, Isuzus, and Suzukis, built under licence. However, thanks to an improved political climate in the 1990s, GM decided to reenter South Africa, eventually buying out the whole of Delta. In 2001, the Chevrolet name made a comeback, used on the Lumina, a rebadged Holden Commodore, and later on, on the Daewoo range of cars. Current Chevrolets (2013) include the Spark Lite (a rebadged Daewoo Matiz), Spark (a third-generation Matiz based on the 2007 Chevrolet Beat), Aveo Sedan and Hatch, the Sonic Sedan and Hatch (the second generation Aveo), Cruze Sedan and Hatch (underpinned by the front-wheel drive GM Delta II platform), the Lumina Sedan (including the Ute model), the Chevrolet Orlando (a five-door, seven-seat compact MPV manufactured by GM Korea under the Chevrolet division for worldwide markets), the Chevrolet Captiva a mid-size sport utility vehicle (SUV) developed by GM Daewoo (now GM Korea) the South Korean subsidiary of General Motors (GM) and sold under the Chevrolet brand, the Chevrolet TrailBlazer (a mid-size sport utility vehicle produced by the Chevrolet division of American automaker General Motors and based on a pickup truck chassis in this case the 2012 Chevrolet Colorado), and a pick-up version which was previously based on the Opel Corsa known as the Corsa Ute; but the current model which in collaboration with GM Brazil who developed it, is the Chevrolet Utility which is based on the Chevrolet Agila platform (a vehicle developed in Brazil and built in Argentina). On May 19, 2017, GM announced that they will withdraw from South Africa, with its truck division and its plant changing hands to Isuzu while at the same time ending all sales and the dealership network of the Chevrolet brand at the end of 2017. GM will work with both Isuzu and PSA (the new owners of Opel, which GM spun off the division to) to ensure existing customers receive parts and technical support during and after the company exit the country. Chevrolet Europe GmbH is a Swiss-based firm (in Zürich) that mainly sells cars produced by GM Korea. Until 2005, Chevrolet Europe sold a few models, mostly United States domestic market (USDM) models modified to suit European regulations. Among them were the Chevrolet Alero (which was a rebadged Oldsmobile Alero) and the Chevrolet Trans Sport (which was a Chevrolet Venture with the front end of the Pontiac Trans Sport). Among other models sold by Chevrolet Europe were the Camaro, the Corsica/Beretta, the Corvette, the Blazer, and the TrailBlazer. The current generation of North American–built Chevrolet Impala V8 sedans has also been available in Europe in recent years, marketed as both large family sedans and more economically priced alternatives to Jaguars and BMWs as high performance executive cars. From 2005 all the mainstream models from GM Daewoo were rebranded as Chevrolet in Europe. (The ownership of the SUV models in the former Daewoo range had reverted to ownership of SsangYong Motor Company by this time.) However the Daewoo name was retained in South Korea and Vietnam until 2011. In the rest of the world, most Daewoo models have worn the Chevrolet badge since 2003. Exceptions include the use of the Suzuki badge in the United States and Canada, the Pontiac badge in Canada, the Holden badge in Australia and New Zealand, and the Buick badge in China. During the mid-2000s, the Corvette and Cadillac range were marketed in Europe through a separate distribution channel operated by Netherlands-based Kroymans Corporation Group but following its bankruptcy in 2010, General Motors established a new Swiss based subsidiary to relaunch Chevrolet in Europe and add the Corvette, Camaro and Malibu models to the European range. In December 2013, General Motors announced that from the beginning of 2016 it will reduce its presence in Europe only to its iconic models, such as the Corvette, in order to strengthen its Opel and Vauxhall brands. Although announcing that they will maintain a broad presence in Russia and the Commonwealth of Independent States, General Motors later announced that they will reduce their line-up to the iconic models in Russia, and more, the Opel division will also exit the Russian market by the end of 2015, while also abandoning production at their Saint Petersburg plant. As of March 2016, only the US-built Corvette Stingray and Tahoe, as well as the Russian-built Niva, were being offered on the Russian market. Chevrolet sales in Western and Central Europe[nb 1] ranged around 200,000 units per year since 2005, peaking at 216,160 units in 2007, while the market share achieved its highest of 1.28 percent in 2012. In Russia, sales grew constantly over the same period, from 67,000 units in 2005 to 205,040 units in 2012, Chevrolet holding a market share of 6.84 percent and being the top import car brand. In 2012, the top markets for Chevrolet in Europe, by the number of registrations, were Italy (31,150), Germany (29,694), France (24,613), Turkey (18,492) and Spain (15,165). The best selling model during the same year was the Aveo (54,800), followed by the Spark (47,600) and the Cruze (40,500). During World War II in Poland, the Home Army of the Polish resistance movement built an improvised armoured car – Kubuś which was based on the chassis of a civilian Chevrolet 157 truck, license-built in pre-war Poland by the Lilpop, Rau i Loewenstein company. The car was used against the German army in Warsaw during the Warsaw Uprising in 1944. The damaged Kubuś survived the war and in 1945 was towed to the Polish Army Museum where it is currently on exhibition. A full-scale operational replica was created in 2004 by Juliusz Siudziński and is, as of 2009, on exhibition at the Warsaw Uprising Museum. Between the autumn of 2007 and the beginning of 2011, the Chevrolet Aveo was produced at the FSO plant in Warsaw, in collaboration with the Ukrainian company UkrAVTO, in both hatchback and sedan body styles. Between 2005 and 2014 GM sold some 60,000 cars under Chevrolet brand that represented 0.5–1% market share compere to Opel's 7% market share each year. GM-AvtoVAZ is a joint venture between GM and the Russian company AvtoVAZ established in 2001, which produces the Chevrolet Niva, an SUV especially designed for the Russian market and conditions. General Motors also operated the GM Avto factory, located in Saint Petersburg and opened in 2008. It was upgraded in 2012 and has produced the Opel Antara and Chevrolet Captiva SUVs, the Chevrolet Cruze from late 2009, and the TrailBlazer from semi-knocked down kits. It ceased production in July 2015, before Chevrolet's exit from the Russian market at the end of the year. In collaboration with the Russian company GAZ, the second generation Chevrolet Aveo was produced at the plant in Nizhny Novgorod for the Russian market, starting from the beginning of 2013, until 2015. Chevrolet vehicles were also produced at the Avtotor plant, located in Kaliningrad. The models produced here were the Lacetti, Aveo, Epica, Captiva, Orlando and Tahoe. Currently (as of December 2017), the Chevrolet Tahoe, Chevrolet Camaro, Chevrolet Corvette, and Chevrolet Niva are officially available for sale in Russia. Historically, many Latin American-market vehicles from GM were modified derivatives of older models from GM's North American and European operations. The current S-10 and Blazer exemplify this strategy. However, more modern vehicles are now being marketed as market conditions change and competition increases. Besides those older models made in Mexico, Ecuador, Colombia, and Mercosur countries, Korean sourced cars from former Daewoo factories some markets also get Korean and U.S. made Chevrolet on top of their local line-ups. In 1924, General Motors started importing Chevrolet Double Phaeton models and were welcomed with great demand. In 1925, in order to reduce costs in the Argentine market, General Motors decided to manufacture in Argentina and started producing a sedan, a roadster, a truck chassis and the Chevrolet Double Phaeton, now called "Especial Argentino", a model exclusively designed for the Argentinean market. Sales increased and soon the Oldsmobile, Oakland and Pontiac units were incorporated to the assembly line. When the Second World War broke out the operations were complicated. In 1941 the Chevrolet 250.000 was made, but the shortage of products made car production impossible. The last Chevrolet went out of the plant in August 1942. In order to avoid the total stoppage, the company made electrical and portable refrigerators and car accessories amongst other items. After the war, GM started producing the Oldsmobile and Pontiac lines and later Chevrolet is added. In 1959, manufacturing plants are enlarged and set up to produce cars, pick ups and trucks. 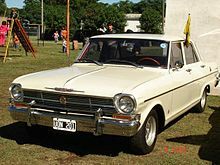 On January 25, 1960 the first Argentinean Chevrolet pick-up was introduced. The following year the national government approves the investment plan for 45 million dollars which included a plant of 12,000 m2. On March 12, 1962 the first Chevrolet 400 was made based on the North American Chevy II. The original plan considered a national integration of 50% during the first year of production; this amount had to be 90% in 1964 with a production of 15,000 units. By 1969, the Chevy line, derived from the American Chevy Nova, was presented. In the middle of the seventies, General Motors market share was reduced sharply from 9% in 1976 to 2% in 1978. Losses exceeded $30 million and the head company in the USA decided to halt production activities in Argentina. The Chevrolet trademark reappeared in 1985 for the production of the pick-up in its versions C-20 and D-20. In 1995, a plan for the manufacturing destined for export specially to Brazil and other countries of Mercosur materialized with the building of a new facility near Rosario, Santa Fe, for the production of the Opel-based Chevrolet Corsa and the Suzuki-based Chevrolet Grand Vitara 4x4. By 2010, the range was based on a variety of GM Korea based cars, together with the Brazilian Chevrolet Prisma. In Brazil, the Chevrolet Opala was based on the German Opel Rekord and American Chevrolet Nova from the late 1960s, continuing in production until the early 1990s, when it was replaced by a version of the Opel Omega. In the basic version had 151 four-cylinder engine with 82 hp and 143.2 lbft. The top of the line version was called Opala SS and used the GM engine 250-S inline six-cylinder and possessed solid lifters with 171 hp and 278.5 lbft, which led to the record breaking South American speed road cars in 1976, with 118.36 mph (190.47 km / h), beating the Puma GTB (which also used the GM 250 engine inline six-cylinder, but without solid lifters) and the Brazilian version of the Dodge Charger R / T 318 and Ford Maverick V8 302 quadrijet. Other smaller Chevrolets in Brazil, such as the Kadett and Monza, were based on the Opel Kadett and Ascona respectively. Chevrolet's product line-up in Brazil comprised some exclusive designs like the Corsa "B" based Celta, which was sold in Argentina under the Suzuki brand, the Astra, and a Brazilian-designed Vectra based on the Opel Astra H. The passenger car range currently includes the Cruze, the Captiva, the Agile hatchback, Chevrolet Onix. The latest home-grown product is the Chevrolet Prisma MKII, released in 2013. Utility and four-wheel drive vehicles line-up includes the S-10, the Blazer, and the Montana. The Montana is a compact pickup truck, based on the Agile, that is also sold in other Latin American markets. From the 1960s to the mid-1980s, there was also a large station wagon, derived from the C10 truck (somewhat similar to the Suburban), called the Veraneio. Chile has a mix of Chevrolet models from different GM brands and platforms branded as Chevrolet. The models come for Chevrolet USA, GM Korea, Mexico, India and other origins. Chevrolet production in Chile began in 1962, although at first through local partners (in this case, Avayu with the Nova II). The Chevrolet C/K truck was manufactured in Chile between 1975-88. Chevrolet has been operating in Ecuador for 80 years. GM Ecuador sells US Chevrolets alongside GM Korea sourced models. It also sells the 1983 Suzuki Supercarry under the Chevrolet name, and the Isuzu Rodeo was sold as the Chevrolet Rodeo throughout the 1990s. The Colombian Automotive Factory SA (Colmotores) was founded in 1956 and initially produced vehicles in Austin; in the '60s, Simca and Dodge automobiles (its first car manufactured was a Coronet 440); and then, in 1980, began producing Chevrolet cars. Currently Colmotores has more than 75% of the domestic market, with models from GM Korea and Suzuki. Particularly worthy of mention is the Aveo, Optra and the Spark. Since the early 1920s, Chevrolet cars and trucks were marketed in this country. The Master Deluxe Sedan of the late 1930s was considered to be a pinnacle of luxury. All cars sold through the local dealer, Neal and Massey (also franchisee for Vauxhall and Buick), were right-hand-drive, and imported from Canada and Australia. Throughout the 1940s and 1950s, GM maintained a market presence with the Bel Air, Impala and Fleetline. During the late 1960s and early 1970s, Australian Holden DeVilles badged as Chevrolet Caprices were sold, though a few "Islander" limited edition American Chevrolet Caprices were imported. Neal and Massey gave up the GM franchise in 1974 and the brand left the market. During the period 1998–2001, Southern Sales Ltd. imported the Chevy Monza and Joy. Based on the Opel Corsa platform and assembled in Mexico, these were the cheapest new cars available. Poor build quality, unprofessional dealer service, and a limited spare parts supply saw these cars exit the market with only a few units being sold. In 2003, the local Renault dealer marketed the Aveo sedan and hatchback, as well as the Optra sedan (a rebadged Suzuki Forenza), with limited success. A more intensive marketing campaign by a subsequent Chevrolet dealer, Lifestyle Motors, met with moderately more success. The models available were the Chevrolet Colorado (Isuzu D-Max twin), Spark (micro-car based on the Daewoo Matiz), Aveo sedan and hatchback, Optra sedan, hatchback and wagon, the Captiva SUV, and the Epica large saloon. In March 2011, the Cruze was added to the lineup and features a 1.8 litre gasoline engine. It bridged the gap between Optra and Epica models. Once the Optra was phased out, a 1.6 litre Cruze was made available. Chevrolet enters a variety of cars in sporting events around the world and is particularly well known in NASCAR, IndyCar, and the FIA World Touring Car Championship. Major teams include Hendrick Motorsports, Richard Childress Racing, and Chip Ganassi Racing, who all drive Chevy SS themed cars. Hendrick has eleven championships, Childress has six championships, and Stewart-Haas has two championships. Chevrolet is the most successful manufacturer to be involved in NASCAR with thirty-nine manufacturer's titles and the most recorded wins by manufacturer. Previously the Chevy Monte Carlo, Impala and the SS were used in both the Monster Energy NASCAR Cup Series and Xfinity Series. They are now using the Camaro in Cup And Xfinity Series, and the Silverado in the Camping World Truck Series. Chevrolet claimed six consecutive Indianapolis 500 wins from 1986 to 1993 and five consecutive CART World Series wins from 1986 to 1992, with notable drivers such as Rick Mears, Al Unser Jr., Michael Andretti, Danny Sullivan, Arie Luyendyk, Emerson Fittipaldi, and Bobby Rahal. Chevrolet replaced Oldsmobile as the General Motor brand at the IndyCar Series from 2002 to 2005. Hélio Castroneves won the Indianapolis 500 and Sam Hornish Jr. the championship, but the American brand had little success the next years. Chevrolet returned to IndyCar in 2012. After several years of Honda being the only engine provider, Chevrolet rejoined the series in 2012. Major teams include Team Penske, KV Racing, Chip Ganassi Racing and CFH Racing who all use Chevy engines. Chevrolet won several races including the 2013 and 2015 Indianapolis 500, as well as three drivers championships. The Corvette runs in the GT LeMans class for Tudor United SportsCar Championship, which was, until 2014, the American Le Mans Series in the GT class, when ALMS merged with Grand-Am to form Tudor United SportsCar Championship. Corvette Racing started in 1999 at the Daytona 24-hour race and has since won eight consecutive ALMS GT1 manufacturers and team championships and seven ALMS GT1 drivers' titles. The Corvette also takes part in the French 24 Hours of Le Mans race. In 2005, when the Chevrolet brand was re-launched in Europe, Chevrolet took part in the WTCC with a version of the Lacetti, developed by the UK-based Ray Mallock Ltd (RML). In 2009 the Cruze replaced the Lacetti and won the Drivers' and Manufacturers' championship from 2010 to 2012. Chevrolet participated in the British Touring Car Championship with the Cruze between 2010 and 2011. In May 2012, Chevrolet replaced Audi as the official automotive sponsor of the English football team Manchester United. From the start of the 2014–15 season Chevrolet became the team's principal shirt sponsor. The deal is contracted to run for seven years, worth a world-record $560 million USD. In July 2012, Chevrolet and English Premier League football team Liverpool F.C. announced a four-year partnership which would see Chevrolet become the official automotive partner of the club. The deal ended two years prematurely, in 2014, following GM pulling the Chevrolet brand out of Europe. GM's subsidiary in the UK, Vauxhall Motors, took over from Chevrolet as the club's automotive sponsor. The Chevrolet bowtie logo was introduced by company co-founder William C. Durant in late 1913. According to an official company publication titled The Chevrolet Story of 1961, the logo originated in Durant's imagination when, as a world traveler in 1908, he saw the pattern marching off into infinity as a design on wallpaper in a French hotel. He tore off a piece of the Sport Wallpapers and kept it to show friends, with the thought that it would make a good nameplate for a car. However, in an interview with Durant's widow, Catherine, published in a 1986 issue of Chevrolet Pro Management Magazine, Catherine recalled how she and her husband were on holiday in Hot Springs, Virginia, in 1912. While reading a newspaper in their hotel room, Durant spotted a design and exclaimed, "I think this would be a very good emblem for the Chevrolet." Unfortunately, at the time, Mrs. Durant didn't clarify what the motif was or how it was used. Ken Kaufmann, historian and editor of The Chevrolet Review, discovered in a November 12, 1911, edition of the Atlanta Constitution newspaper, an advertisement from the Southern Compressed Coal Company for "Coalettes", a refined fuel product for fires. The Coalettes logo, as published in the ad, had a slanted bowtie form, very similar to the shape that would soon become the Chevrolet icon. The date of the paper was just nine days after the incorporation of the Chevrolet Motor Co. One other explanation attributes the design to a stylized version of the cross of the Swiss flag. Louis Chevrolet was born in Switzerland at La Chaux-de-Fonds, Canton of Neuchâtel, to French parents, on Christmas Day 1878. An October 2, 1913, edition of The Washington Post seems, so far, to be the earliest known example of the symbol being used to advertise the brand. The first bowtie logo without embedded text first appeared in 1985, as part of the Heartbeat of America ad campaign. In 2004, Chevrolet began to phase-in the gold bowtie that serves as the brand identity for all of its cars and trucks marketed globally, where previously the logo was blue for passenger cars and gold for trucks. The Klavika Condensed font was designed by type design studio Process Type Foundry under the art direction of Aaron Carámbula for General Motors marketer FutureBrand as part of Chevrolet's 2006 redesign. After the expiry of the exclusivity period, the commercial version of the font (Klavika Condensed) was released to the public in the fall of 2008. In the Young Creative Chevrolet corporate identity guidelines, Klavika is listed for use in all communication materials. Klavika was phased out beginning in 2012 and replaced by Knockout (from Hoefler & Frere-Jones) while the campaign was still ongoing. Currently, Goodby, Silverstein & Partners is utilizing the typeface families Louis, a group of simplified, legible grotesque gothics named after co-founder Louis Chevrolet, and Durant, a roman group, just as simplified and legible, named after co-founder William Durant, on print, television and Chevrolet's website advertisements. As part of Chevrolet's 100th anniversary in 2011, a dedicated channel was created by the American internet based Pandora Radio station, playing the Top 100 songs mentioning the brand. Beginning on November 3, 2011, Chevrolet celebrated the countdown to its 100th birthday by encouraging its customers and fans to tell their Chevy stories, vote for their favorite Chevrolet cars and trucks, and take the birthday party to their communities with the help of Chevrolet and its dealers. A feature-length documentary titled 'Chevy100, An American Story', produced by Roger Sherman, was premiered on November 3 at Detroit Institute of Arts in downtown Detroit, features drivers, collectors, restorers, racers and journalists who live and breathe cars and trucks. In honor of the 100th birthday of Chevrolet, Indianapolis Motor Speedway, Chevrolet and Indianapolis businessman David Ring have arranged to properly mark the grave of Arthur Chevrolet, brother of Chevrolet co-founder Louis Chevrolet. Earlier marketing efforts touted efficiency combined with savings – ("enormous buying power," 1914; "Quality at low cost," 1923, ""A Six for the Price of a Four," 1929), interspersed with what could be described as "loftier" messages (positioning the automobile –and Chevy by extension—as "Man's conquest of time," 1923). Of the marketing campaigns from more recent decades, "See the U.S.A. in Your Chevrolet" (used in the 50s and 60s) was one of the longest lasting. In 1949 Chevy sponsored "Inside USA" on CBS; while this was a short-lived show, the tune created for it got new life in 1951, when Chevy began sponsoring the Dinah Shore show and Shore sang it at the close of every show. Chevy Runs Deep (2010–2013; United States): A series of TV commercials were produced with Goodby, Silverstein and Partners, and was unveiled during the week of 2010 MLB World Series. Early commercials include 'Chevrolet: Anthem', 'Chevrolet: Dogs and Pickups', 'First Car', 'Chevrolet: Coming Home', 'Chevrolet Volt: Anthem', which positioned Chevy as a brand that is part of the American fabric in song, culture and in most of our pasts in one way or another. In 2011, General Motors announced the campaign would continue. Most television commercials run in this ongoing campaign feature voice-over by television and film star Tim Allen. LOVE. LIFE. CHEVROLET (2012–present; South Korea, Japan) As part of the Cruze campaign (in association with MacLaren McCann, Canada), outdoor vinyl materials, recycled seatbelts and bicycle inner tubes were made into messenger bags, laptop sleeves, and oversize totes. What do you #playfor (2012–present; Global Campaign): Chevrolet sponsors Manchester United replacing Aon as the shirt sponsor. The campaign slogan, "What do you #playfor?" attempts to engage users on social media. Chevrolet also launched multiple sites across the globe under the main Chevrolet Football Club website. Find New Roads (2013–; United States, Canada, Latin America): The slogan replaced the previous Chevy Runs Deep tag line, after Chevy Runs Deep campaign had been criticized as ineffectual. External applications of 'Find New Roads' was set to begin globally later in the first quarter of 2013. The first Find New Roads commercial, a 90-second commercial titled 'Dog & Doe' (produced by Commonwealth) featuring Chevrolet Volt, Spark, Sonic, Impala, Corvette Stingray, was premiered during 2013 Grammy Awards. The campaign was expected to cover 13 product launches for 2013 in the U.S. and 20 introductions throughout the world.In 2018 South Korea added a new slogon called 'Find New Roads'+'다시 힘차게 달리다.' Now they use 'Find New Roads' again. Chevrolet's advertisement promoting reliability has been pulled after recent backlash. In the advertisement (which is part of their "Real People. Not Actors" campaign), Chevrolet spokesperson Potsch Boyd claims that "based on a recent nationwide survey (by Ipsos), Chevy is more reliable than Toyota, Honda, and Ford." However, Chevrolet included a disclaimer stating that the survey was based on 2015 model year vehicles; several of these vehicles have been updated (facelifted and/or redesigned) since then. According to the Detroit Free Press and Detroit News, Ford, Honda and Toyota all challenged the accuracy of the claim. Furthermore, these claims were challenged by Consumer World, which noted that independent studies by J. D. Power and Consumer Reports contradicted them. FutureBrand, an Interpublic Group of Companies company, has been working with General Motors since 2000, who also involved the commissioning of a font that would later sold as Klavika Condensed, as part of re-design of Chevrolet in 2006. In 2010, General Motors replaced the advertising agency Campbell Ewald, also of Interpublic Group of Companies, with Publicis Worldwide. Campbell-Ewald had served Chevrolet since 1919. In May 2010 Chevrolet's advertising account was awarded to Goodby, Silverstein and Partners. As part of the attempt to attract 18- to 24-year-old drivers, General Motors hired MTV Scratch. Some of the collaboration results include Chevy ads showing their cars skydiving, bungee jumping, doing other stunts. The commercial was produced with consultations from students from UCLA, Pepperdyne and high schools. Some of the footage was later used in Chevrolet Sonic ad titled 'Stunt Anthem' during Super Bowl XLVI. In March 2012, General Motors announced two competing agencies, San Francisco-based Goodby, Silverstein and Partners (part of Omnicom Group), and New York-based McCann Erickson Worldwide (part of Interpublic Group), will join to form an equal joint venture company called Commonwealth to handle most of Chevrolet's ads. Prior to the joint venture, Goodby, Silverstein and Partners performed marketing in the U.S., including the "Chevy Runs Deep" campaign; McCann handled Chevrolet ads in China, Latin America, Mexico, Canada and other markets. Commonwealth would handle and supervise creative work worldwide out of Detroit for all markets except China, India and Uzbekistan, where GM has joint auto-making ventures. McCann would continue to handle ads in China and India, and Uzbekistan will be contracted as needed. MacLaren McCann continued on as AOR for the entire GM brand in Canada, but the Chevrolet brand will act as a “spoke” to Detroit’s creative hub, with content and messaging flowing through Commonwealth, but adapted for the Canadian market. Performance Marketing Group Incorporated manages Chevrolet Racing’s experiential marketing properties for its at-track activation platforms in conjunction with the NASCAR Sprint Cup Series, the IZOD IndyCar Series, and the American Le Mans Series with Team Corvette. In 2010, a memo signed by Chevrolet sales and service vice president Alan Batey and General Motors marketing division vice president Jim Campbell was sent to Chevrolet employees at its Detroit headquarters, instructing employees to only use Chevrolet when addressing the brand, in order to present a consistent brand message. A postscript to the memo says a sort of cuss jar - a plastic "Chevy" can - has been placed in the hallway. "Every time someone uses 'Chevy' rather than Chevrolet," the note said, the employee is expected to put a quarter in the can. The proceeds were to be spent on "a team building activity." Paul Worthington, head of strategy for Wolff Olins, noted that the branding effort ran counter to a trend in which corporate names had become more casual. Ian Beavis of Nielsen Automotive Group noted that marketers cannot control what consumers call their products, but nicknames do not work in new markets where Chevrolet is trying to get a start. Following the release of the memo, General Motors published a statement claiming the note was in no way discouraging customers or fans from using the Chevy name. Following the 2010 memo incident, Chevy Runs Deep campaign remains to use the 'Chevy' name, while Driving Our World Forward and Find New Roads campaigns uses the 'Chevrolet' name. In 2007, General Motors allowed AJS-Production SA to register the Louis Chevrolet trademark for a line of premium quality Swiss watches watch marketed under the Louis Chevrolet brand name. Although the watches bear the name of Louis Chevrolet, they are not marketed or produced in association with General Motors. The watch brand pays tribute to Louis Chevrolet, co-founder of the Chevrolet automobile company, whose father was a watchmaker and in his childhood helped his father at the workbench. The collection was called Frontenac, the name inherited from the race car company founded by Louis Chevrolet. The Chevrolet watch collection comprises automatic, manually wound and quartz models, equipped with ETA and Ronda movements. The Louis Chevrolet Frontenac watches, manufactured in Porrentruy, the Swiss Jura region, feature the styling cues suggested by the Chevrolet cars. The collection was developed while applying the same materials as used in the car industry. Pearled appliques on the Chevrolet watches' dials remind the metal forms of the old dashboards. The number "8", Chevrolet's racing number, is sported on the case back. ^ Including Southeastern Europe, Turkey and Iceland, excluding Belarus, Ukraine and Moldova. ^ Corporate Officers (January 15, 2014). "Alan Batey – GM Corporate Officers". GM.com. Archived from the original on July 14, 2014. Retrieved August 19, 2014. ^ "Chevrolet 1911–1996". GM Heritage Center. 1996. p. 97. Retrieved October 1, 2014. ^ 60 years of Chevrolet. Crestline. 1972. ^ Luft, Alex. "General Motors To Move Opel Upmarket, Position Chevy As "Value" Brand". Retrieved November 17, 2013. ^ "General Motors to withdraw Chevrolet brand from Europe". BBC News. December 5, 2013. ^ "The Whiting - History". Thewhiting.com. Retrieved October 7, 2017. ^ Auto Editors of Consumer Guide (August 1, 2007). "1911, 1912, 1913 Chevrolet Series C Classic Six". Auto.howstuffworks.com. Retrieved December 27, 2010. ^ "Chevrolet Bowtie also found in GM archives on 1914 add for 1915 Chevrolet. History". Retrieved July 21, 2006. ^ "The History of Chevrolet". GearHeads. May 22, 2012. Retrieved July 29, 2012. ^ Gustin, Lawrence R. (2008). Billy Durant: Creator of General Motors. University of Michigan Press. pp. 266–267. ISBN 0-472-03302-6. ^ "Chevrolet Bowtie History". Chevrolet Review. VCCA club. July 1990. ^ "Coalettes (Advertisement)". Atlanta Constitution. November 12, 1911. p. 7. Retrieved October 2, 2014. ^ McPhee, John (1994). La Place de la Concorde Suisse. Farrar, Straus and Giroux. ISBN 9780374519322. ^ The Sun, Baltimore, January 21, 1917 and GM archives ad for 1915 Chevrolet, Part 6, Page 14. ^ Cobb, James G. (June 15, 1997). "The Return of Detroit's 'Low Priced Three'". The New York Times. Retrieved April 4, 2013. ^ Springfield Union, February 17, 1957, Page 75. ^ Dallas Morning News, November 22, 1956, Part 1, Page 12. ^ Gunnell, John, ed. (1987). The Standard Catalog of American Cars 1946–1975. Kraus Publications. pp. 134–183. ISBN 0-87341-096-3. ^ "Chevrolet to launch Daewoo-built model line in Europe from January". Just Auto. September 16, 2004. Retrieved July 18, 2012. ^ a b Cobb, Jeff (July 26, 2016). "Top-Selling Chevy Volt Crosses 100,000 US Sales Milestone". HybridCars.com. Retrieved July 26, 2016. As of June 2016[update], around 117,000 units of the Volt/Ampera family have been sold globally, including close to 10,000 Opel/Vauxhall Ampera variants sold in Europe. Volt sales in the American market passed the 100,000 milestone in July 2016. ^ Eberle, Ulrich; von Helmolt, Rittmar (May 14, 2010). "Sustainable transportation based on electric vehicle concepts: a brief overview". Royal Society of Chemistry. Retrieved June 8, 2010. ^ Mat Gasnier; Austin Rutherford (March 20, 2013). "World Full Year 2012: Discover the Top 1000 best-selling models!". Best Selling Cars Blog. Retrieved March 28, 2013. ^ Mat Gasnier (February 10, 2013). "Europe Full Year 2012: Now with Top 350 models & Top 60 brands". Best Selling Cars Blog. Retrieved February 13, 2013. Ampera sales in Europe totaled 5,268 units in 2012 and 304 in 2011. ^ Christopher Bruce (December 12, 2012). "Europe's Best Selling Electric Car Is the Opel/Vauxhall Ampera". Autovia. Retrieved February 13, 2013. ^ Jeff Cobb (November 4, 2015). "GM Sells Its 100,000th Volt in October". HybridCars.com. Retrieved November 4, 2015. About 102,000 units of the Volt/Ampera family have been sold worldwide by the end of October 2015. ^ Cobb, Jeff (August 10, 2016). "Global 10 Best-Selling Plug-In Cars Are Accelerating Forward". HybridCars.com. Retrieved August 13, 2016. As of June 2016[update], cumulative global sales of the top selling plug-in electric cars were led by the Nissan Leaf (over 228,000), followed by theTesla Model S (129,393), Votl/Ampera family (about 117,300), Mitsubishi Outlander PHEV (about 107,400), Toyota Prius PHV (over 75,400), BYD Qin (56,191), Renault Zoe (51,193), BMW i3 (around 49,500), Mitsubishi i-MiEV family (about 37,600) and BYD Tang (37,509). ^ Fleming, Charles (September 12, 2016). "Chevy Bolt EV range is 238 miles: Prime time for the electric car?". Los Angeles Times. Retrieved September 13, 2016. ^ Cobb, Jeff (September 29, 2016). "Renault Zoe Enters Market Slightly Ahead of Chevy Bolt As First 'Affordable' (Roughly) 200-Mile EV". HybridCars.com. Retrieved October 3, 2016. ^ Cobb, Jeff (November 23, 2016). "2017 Chevy Bolt's Trophy Case Is Filling Up". HybridCars.com. Retrieved November 23, 2016. ^ a b GM Press Release (January 20, 2012). "GM global sales up 7.6% in 2011 to 9.026M vehicles; China and US largest markets". Green Car Congress. Retrieved January 20, 2012. ^ Jensen, Cheryl (April 23, 2010). "Forecast Says China Provides Opportunities and Competition". The New York Times. Retrieved April 23, 2010. ^ Christina Rogers (November 3, 2011). "Chevy expands global reach". The Detroit News. Retrieved December 15, 2011. ^ Carsalesbase. "Chinese Car Sales Data - Chevrolet". Carsalesbase. Retrieved April 17, 2019. ^ Matt Gasnier. "Best Selling Cars Blog - China Retail February 2019". BestSellingCarsBlog. Retrieved April 17, 2019. ^ "Hicomobil Looking at 6,000 Units of Chevrolet in 2004". Autoworld. Retrieved May 31, 2012. ^ "Cars, Sedans, Hatchbacks, Compact & City Cars - Chevrolet UAE". Chevrolet United Arab Emirates (UAE). Archived from the original on October 29, 2012. Retrieved October 7, 2017. ^ "Chevrolet Philippines strengthens customer service in 2012". Chevrolet Philippines. April 1, 2012. Archived from the original on June 27, 2013. Retrieved June 23, 2013. ^ a b "About Chevrolet Philippines". Chevrolet Philippines. April 1, 2012. Archived from the original on June 13, 2013. Retrieved June 23, 2013. ^ "Flagships star in GM Holden's export record". Next Car. February 1, 2006. Retrieved December 19, 2014. ^ "Proliance". Proliance. Retrieved February 28, 2012. ^ "2011 Thailand Automobile Industry Review". Archived from the original on April 3, 2015. Retrieved February 28, 2012. ^ "404". Uzavtosanoat.uz. Retrieved October 7, 2017. ^ a b c Norm Darwin (1983). The History of Holden Since 1917. E.L. Ford. ISBN 978-0-9592287-0-0. Retrieved August 18, 2014. ^ "Holden Cars History". Classicholdencars.com. Retrieved October 7, 2017. ^ Frans Erasmus. "Springbok Radio Sounds: Chevrolet". Springbokradio.com. Archived from the original on May 11, 2011. Retrieved December 27, 2010. ^ "1972 Chevrolet Kommando Brochure". Moby302.co.za. Retrieved December 27, 2010. ^ "1976 Chevrolet Constantia AJ Brochure". Moby302.co.za. Archived from the original on March 20, 2008. Retrieved December 27, 2010. ^ "Kroymanscorporation". Kroymanscorporation.com. Archived from the original on April 25, 2009. Retrieved April 28, 2009. ^ "Caddy in Europe? Heard it before -- it won't happen". Autonews.com. Retrieved October 7, 2017. ^ "Chevrolet press release 6 September 2011". Media.gm.com. September 6, 2011. Retrieved March 16, 2013. ^ "GM Strengthens its European Brand Strategy". Chevrolet Europe. December 5, 2013. Archived from the original on December 8, 2013. Retrieved December 8, 2013. ^ "GM's Opel to exit Russia, Chevy to reduce lineup to 'iconic' models". Automotive News. March 18, 2015. Retrieved March 17, 2016. ^ "Chevrolet". Web.archive.org. March 18, 2015. Archived from the original on March 16, 2016. Retrieved March 17, 2016. ^ "Chevrolet NIVA". March 18, 2015. Archived from the original on March 12, 2016. Retrieved March 17, 2016. ^ "Chevrolet achieves 4th consecutive year of market share growth in Europe". Chevrolet Europe. January 15, 2013. Archived from the original on December 8, 2013. Retrieved December 8, 2013. ^ "Chevrolet Europe Fast Facts". Chevrolet Europe. July 17, 2013. Archived from the original on December 8, 2013. Retrieved December 8, 2013. ^ a b c "Sales Highlights". Chevrolet Europe. Archived from the original on December 8, 2013. Retrieved December 8, 2013. ^ "Chevrolet with Record Sales in Europe in 2005". Chevrolet Europe. January 10, 2006. Retrieved December 8, 2013. ^ "Chevrolet achieves 4th consecutive year of market share growth in Europe". Chevrolet Europe. January 15, 2013. Retrieved December 8, 2013. ^ "Polish Armor 1939 – Improvised Armored Car Kubus". Achtungpanzer.com. January 27, 2009. Archived from the original on February 26, 2013. Retrieved March 16, 2013. ^ "GM and UkrAVTO begin Chevrolet production in Poland". Chevrolet Europe. November 6, 2007. Retrieved December 8, 2013. ^ Chevrolet wyrzucony z Europy. Opel ma dość wewnętrznej konkurencji? ^ "General Motors Enters New Era in Russia". GM News. June 22, 2012. Retrieved December 8, 2013. ^ "GM opens USD300 million assembly plant in Russia". The Auto Channel. November 7, 2008. Retrieved December 8, 2013. ^ "GM Launches Chevrolet Trailblazer Assembly in Russia". WardsAuto. April 22, 2013. Archived from the original on December 17, 2013. Retrieved December 8, 2013. ^ "GM car assembly plant in Petersburg ceases production". Russia & India Report. July 1, 2015. Retrieved March 17, 2016. ^ "First Chevrolet Aveo Comes Off Assembly Line at GAZ Auto Plant in Nizhny Novgorod, Russia". Automotive World. February 5, 2013. Retrieved December 8, 2013. ^ "GM pulls assembly out of troubled Russian market; VW cuts back in Kaluga". Automotive Logistics. March 25, 2015. Retrieved March 17, 2016. ^ "ОБЗОР МОДЕЛИ". Автотор. Retrieved December 10, 2013. ^ "Just Auto 3 August 2011". Just-auto.com. August 3, 2011. Retrieved November 6, 2011. ^ "Corvette Racing official website". Corvetteracing.com. October 4, 2008. Archived from the original on October 31, 2011. Retrieved November 6, 2011. ^ "Popular Mechanics 2011". Popularmechanics.com. July 30, 2010. Retrieved November 6, 2011. ^ "Chevrolet WTCC website". Chevroletwtcc.com. May 21, 2006. Archived from the original on July 31, 2012. Retrieved November 6, 2011. ^ "Chevrolet UK website". Chevroletbtcc.co.uk. October 27, 2011. Archived from the original on March 25, 2010. Retrieved November 6, 2011. ^ Stone, Simon. "Chevrolet". The Independent. London. Retrieved November 6, 2011. ^ "Man Utd gets Chevrolet as new shirt sponsor". BBC News. July 30, 2012. ^ Herbert, Ian (July 26, 2014). "Manchester United pre-season tour: Louis van Gaal must learn to live with lucrative United tours". The Independent. Retrieved July 29, 2014. ^ "History with a Mystery: The Chevrolet Bowtie". Media.gm.com. September 2, 2011. Retrieved March 16, 2013. ^ Ken Kaufmann. "Chevrolet Bowtie History". Home.earthlink.net. Retrieved March 16, 2013. ^ "Uftring Chevrolet - The evolution of the Chevy bowtie". Archive.is. May 14, 2012. Archived from the original on May 14, 2012. Retrieved October 7, 2017. ^ Aaron Richardson. "How Chevrolet decided on its iconic Bowtie logo". Autoblog.com. Retrieved March 16, 2013. ^ "Custom Fonts". Processtypefoundry.com. Archived from the original on February 23, 2013. Retrieved March 16, 2013. ^ "Knockout, the functional family". Typography.com. Retrieved March 16, 2013. ^ "Chevrolet Celebrates 100 Years in Song" (Press release). Media.gm.com. July 27, 2011. Archived from the original on July 12, 2012. Retrieved March 16, 2013. ^ "Chevy Marks 100 Years with Fans, Owners and Communities" (Press release). Media.gm.com. July 27, 2011. Archived from the original on July 13, 2012. Retrieved March 16, 2013. ^ "'Chevy100, An American Story' premieres in Detroit" (Press release). Media.gm.com. November 2, 2011. Archived from the original on July 10, 2012. Retrieved March 16, 2013. ^ "Arthur Chevrolet's Grave Gets Marker on Chevrolet Birthday" (Press release). Media.gm.com. November 3, 2011. Archived from the original on July 11, 2012. Retrieved March 16, 2013. ^ Boles, Doug (November 3, 2011). "100 Years Later - Chevrolet name still involved at IMS". Indianapolismotorspeedway.com. Retrieved March 16, 2013. ^ Jerry Garrett (October 21, 2011). "A Century of Chevy, From Cheap Date to America's Sweetheart". The New York Times. Retrieved January 9, 2012. ^ "100 YEARS: From 'See the USA in your Chevrolet' to 'Like a Rock,' Chevy ads run deep". Automotive News. October 31, 2011. Retrieved January 9, 2012. ^ Jack Doyle (March 22, 2009). "Dinah Shore & Chevrolet, 1956-1963". Pop History Dig. Retrieved January 9, 2012. ^ "Chevrolet to employ new "Excellence for Everyone" ad campaign". Autoblog.com. March 11, 2010. Retrieved October 8, 2010. ^ Kiley, David. "The Why? behind "Chevy Runs Deep" slogan". Autoblog.com. Retrieved March 16, 2013. ^ Shunk, Chris. ""Chevy Runs Deep" campaign to stick around". Autoblog.com. Retrieved March 16, 2013. ^ "Chevrolet - Driving our world forward". Gm.ca. Retrieved March 16, 2013. ^ "Driving Our World Forward". Holidayfilms.wordpress.com. September 28, 2011. Retrieved March 16, 2013. ^ "GM Canada begins "largest vehicle launch" in its history". Marketingmag.ca. October 4, 2011. Retrieved March 16, 2013. ^ Shaw, Hollie (October 14, 2011). "Chevy repositions". Business.financialpost.com. Retrieved March 16, 2013. ^ "2012 CHEVROLET LOVE LIFE AD KOREA 1 LOVE LIFE KOREA". Dragtimes.com. Retrieved March 16, 2013. ^ "Chevrolet: Billboards Into Bags". Adsoftheworld.com. September 25, 2010. Archived from the original on March 17, 2013. Retrieved March 16, 2013. ^ "Chevrolet Converts Old Billboards into Stylish Bags". Chevroletofjoplin.com. March 4, 2012. Archived from the original on February 15, 2013. Retrieved March 16, 2013. ^ Chevrolet: Billboards Into Bags. "Chevrolet: Billboards Into Bags". Ibelieveinadv.com. Retrieved March 16, 2013. ^ Chevrolet. "Chevrolet: What do you #playfor?". chevrolet.com. ^ Buss, Dale (April 18, 2012). "Chevrolet To 'Find New Roads' As It Drops 'Chevy Runs Deep'". Forbes.com. Retrieved March 16, 2013. ^ Ross, Jeffrey N. "Chevrolet introducing "Find New Roads" global tagline". Autoblog.com. Retrieved March 16, 2013. ^ "Chevrolet Will 'Find New Roads' as Brand Grows Globally - Aligns around the world behind singular vision" (Press release). Media.gm.ca. January 8, 2013. Retrieved March 16, 2013. ^ Buss, Dale (April 18, 2012). "Chevy Touts Product Variety In Inaugural 'Find New Roads' Ad". Forbes.com. Retrieved March 16, 2013. ^ Nudd, Tim (February 19, 2013). "Inside Chevrolet's Bustling, Magical 'Find New Roads' Launch Spot Commonwealth's Linus Karlsson on creating five ads in one By Tim Nudd". Adweek.com. Retrieved March 16, 2013. ^ "Chevrolet's new tagline: 'Find new roads'". Freep.com. Retrieved March 16, 2013. ^ Levy, George (18 January 2019). "Chevy Pulls Commercial Claiming Superior Reliability". Car and Driver. Retrieved 18 January 2019. ^ "GM Expressing the corporate vision". Futurebrand.com. Archived from the original on March 8, 2016. Retrieved October 7, 2017. ^ "GM dumps Chevrolet's longtime ad agency -- like a rock ", USA Today, April 26, 2010. ^ McMains, Andrew. "GM Confirms Chevy's Shift to Goodby". Adweek. Retrieved August 4, 2011. ^ Tutor, Chris. "GM turns to MTV to sell cars to younger generations". Autoblog.com. Retrieved March 16, 2013. ^ Team Scratch (March 20, 2012). "Crowdsourcing: Next Gen Consumers in the Driver's Seat". Blog.mtvscratch.com. Archived from the original on July 2, 2012. Retrieved March 16, 2013. ^ "SXSW: Crowdsourcing". Blog.gsdm.com. March 14, 2012. Retrieved March 16, 2013. ^ "Chevy Sonic "Stunt Anthem" | Chevy Super Bowl XLVI Ads | Chevrolet Commercial". Dailymotion.com. October 2, 2012. Retrieved March 16, 2013. ^ Krisher, Tom (March 27, 2012). "GM to combine Chevy advertising, hopes to save $2B". Boston.com. Retrieved March 16, 2013. ^ Megan Haynes (March 27, 2012). "Chevrolet merges creative teams to form global agency". Strategyonline.ca. Retrieved March 16, 2013. ^ "Performance Marketing Group - Chevrolet Motor Division". Pmgincorporated.com. Archived from the original on April 11, 2013. Retrieved March 16, 2013. ^ Chang, Richard S. (June 9, 2010). "G.M. Proposes Leaving a Car's Popular Nickname in the Dust". Nytimes.com. Retrieved October 7, 2017. ^ Woodyard, Chris (June 11, 2010). "Chevrolet memo gets the word out: Don't call me Chevy". USAtoday. Retrieved March 16, 2013. ^ "Statement on the use of Chevrolet and Chevy" (Press release). GM Media. Archived from the original on June 13, 2010. Retrieved March 16, 2013. ^ Schepp, David (June 10, 2010). "The Name Is 'Chevrolet' - Not 'Chevy.' Er, Never Mind". Dailyfinance.com. Archived from the original on October 23, 2012. Retrieved March 16, 2013. ^ "Chevy vs. Chevrolet An Explanation". Youtube.com. June 10, 2010. Retrieved March 16, 2013. ^ "Louis Chevrolet Swiss Watches". worldtempus.com. December 28, 2009. Retrieved January 2, 2011. ^ "Legendary Chevrolet on the Wrist". Watches.infoniac.com. September 26, 2007. Retrieved December 27, 2010.